“They will be tomorrow.” his mother smiled. “...anyway, just because boys don't normally wear skirts doesn't mean they'd look stupid if they did.” she added, reminding me that boys and men in Scotland and Ireland often wear kilts. “The skirts at your school are very similar to a kilt.” his mother retorted. Being pleated and plaid, she's not wrong. “Yeah but.” Toby began... but he didn't have anything to say. After a short silence, he asked if he could go and get changed. “Homework first.” his mother replied. In the last few weeks Toby's mother has decided that he's not allowed out of his school uniform until his homework is complete in the hope that he'll do it sooner rather than later. "You know the rules Toby... school isn't over 'til you've done your homework." she reminded him. “OK.” he moaned, before grabbing his school bag and heading to his room. “Mu-um!” he hollered from his room. “Yes?” his mother hollered back from the kitchen. “Why is there a skirt on my bed?” he asked from the landing. “I told you that I'm not getting involved.” he replied in exasperation. Toby's mother has always been a keen protester. Only last summer she was protesting against fracking and in her youth she protested against the poll-tax and camped at Newbury for a couple of months. She marched against the bombing of Iraq and more recently against the government's penny pinching austerity policies. She strongly believes that if you want something, you have to at least stand up and be counted. Through a combination of logic and pestering, Toby reluctantly donned the skirt. “It's really short!” he whined. His fingers hovered nervously around the pleaded hem. “It's certainly not too short.” she said. “Most of the girls wear them that length.” she added. “That's where your waist is.” she informed him. “Not on my trousers it isn't.” he stated. “It's not a pair of trousers.” she stated. “Turn around... let me have a proper look.” she asked. “It looks ridiculous.” he moaned as he kicked out his foot, bearing a black leather lace up shoe and a wrinkly grey ankle sock. “And that's what you need to practice.” she replied. He adopted a bemused expression. “For a start you need to remember to keep your knees together.” she said, drawing his attention to the fact that his had parted. He snapped them shut. She smiled and informed him that he needs to learn how to not flash his underwear. “Come on.” she said. He bundled his books and pencil case and followed his mother downstairs. His skirt swished with every step and whilst it didn't feel uncomfortable to wear, he certainly felt uncomfortable wearing it. As they descended the stairs, Toby told himself that he'd avoid his reflection in the hallway mirror but his mother had other ideas. She drew him to a halt at the foot of the stairs and he had no option but to face himself. “It looks quite nice.” his mother claimed. “My legs look stupid.” he said. His grey socks stand halfway up his calves and the pale fuzzy hairs make his legs appear out of focus. “They'd look better with different socks on.” his mother said. “They look stupid because they're hairy.” he replied. “They're not that bad.” his mother insisted before setting him down at the kitchen table to do his homework. She instructed him how to sit without scrunching the pleats and to always smooth them over his lap. She'd infrequently say “knees” as she pottered around him and he'd instantly snap them together. She suggested putting him in a pair of frilly knickers to encourage him to keep them together. She suggested wearing a pair of shorts beneath it. “None of your shorts are short enough.” she informed him. “...and I was only joking about the knickers... just try to remember to keep your knees together.” she advised. Toby sat and did his homework whilst his mother did the ironing. Their supper simmered on the hob. He began to shut his books and put his stationary away. “Have you finished?” she asked. “Yeah.” he replied. “Can I get changed now?” he asked. “I think you should keep it on until bath time.” his mother replied. Of course he whined at this suggestion, but his mother told him that he'll be wearing it all day at school tomorrow so a few more hours tonight won't do any harm. He wore it whilst eating and wore it whilst washing the dishes. He wore it whilst watching TV and got used to wearing the unusual garment... but he still felt it looked stupid. His mother said that didn't matter... in fact it's the core of the protest, she claimed. Toby reiterated that it's not so much the skirt, but his legs. The following morning he sits at the breakfast table, nervously shovelling his his bowl of cereal into his mouth. “I'm going to feel like such a ninny today.” he moans. He knows she's right but would rather others make the stand and he didn't. Having tried the skirt for size the previous evening, Toby knew it looked stupid with his hairy legs and boy's grey ankle socks. His mother addressed that by giving him a tube of Veet and a pair of 'nice' socks. “I look like a girl.” Toby moaned as he looked down at his hairless legs and scallop topped ankle socks. “No you don't... you look like a boy in a skirt.” his mother replied. “At least now your legs look nice rather than stupid.” she said. He's as nervous as hell as he grabs his school bag before being shown to the door. His mother tells him how proud she is before he steps out alone. Ironically, the five day heatwave is drawing to a close and the air is distinctly cooler than previous days. The breeze is up and he fears it might catch his skirt and reveal his underpants. He keeps his hands ready to grab it should that happen, but not having any pockets, he doesn't really know what else to do with them. The first group of school boys he sees are all wearing trousers and he begins to worry that he might be the only one... but as he nears the main road and even more groups of school kids, he breathes a sigh of relief when he sees other boys have joined in the protest and are attending wearing the girl's uniform. He sniggers. They mostly look ridiculous, especially the older boys with stubbly chins and really hairy legs. The girls laugh and coo. There's a handful of journalists and photographers at the school gates chatting to a group of maybe ten or fifteen skirted boys. He and many others avoid the cameras, but they can't avoid the attention from the girls. All in all, he figures there's maybe fifty or sixty boys taking part on the protest so he's certainly not alone. But so far as he can tell, all of the others are wearing their skirts considerably longer than he is, and the girl's waste no time in pointing out that unlike the others, he's had the good sense to shave his legs and wear some 'nice' socks. Glumly, he tells them that he didn't shave his legs but used some cream that his Mum had given him. “I didn't really want to... not just for one day but my mum insisted.” he reluctantly informed the crowd that had gathered around him and a handful of other skirted boys. Some of the others said they were only going to do it the once, to make a point. Tomorrow, they'll be back in long pants, or shorts if they're allowed. Having removed the hair from his legs, it was presumed that he was in for a long protest, possibly lasting until the end of term, a whole five weeks away. The boys involved weren't punished for taking part in the protest. 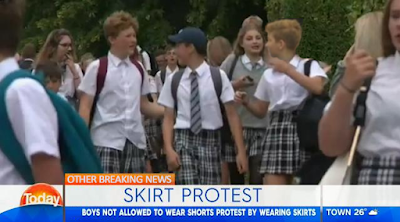 In fact their endeavour was praised by many teachers, but suggested that they don't wear skirts again tomorrow because they've made their point. “So how was school today?” his mother asked upon his arrival home at around 3.15pm. “OK.” he mumbled. “Can I get changed?” he asked. “You've got a uniform on, that's all that matters.” his mother replied. “Were lots of other boys wearing skirts today?” she asked. “You made it on the Today programme... just a brief glimpse, but it's clearly you.” his mother said. Toby wasn't entirely sure what she was on about, so she opened up her laptop, logged into FaceBank and quickly found the brief video someone had posted. It's only twenty seconds. She paused it at just the right moment and tapped her manicured nail on the screen. Toby's jaw dropped. “Oh god... my skirt's really short!” he realised. “It's not 'really' short.” she insisted. “It's the same length the girls wear them; high mid-thigh.” she told him. “Were they impressed that you'd shaved your legs too?” she asked. “It's supposed to be a fight for the greater good, not a personal struggle.” his mother claimed. “I protested against the Poll Tax on behalf of those who couldn't afford it... I marched against the invasion of Iraq for the people who live there... I'm neither gay, trans or disabled but support their rights...” she went on. Toby listened with intent and raised a few contrary points of his own. But his mother, being a seasoned debater easily refuted them. “So... I'm wearing this tomorrow whether I like it or not?” he mournfully asked. “You may as well. Giving up at this early stage is pointless... and it can't be that bad. It's just a skirt.” his mother reckoned. Much against his better judgement, Toby attended school the following day wearing the skirt again. The numbers engaging with the protest had dwindled to around thirty boys in the entire school, but fortunately for Toby, he wasn't the only one in his class. The other boy who'd been quite vocal about keeping up the protest until the uniform rules are changed has also returned wearing a skirt. At break and lunch, the skirted boys gravitate to one another. Chants of 'we want shorts' are quickly quelled by the teachers who tell then that if they want to exercise their right to protest, they must do it quietly and orderly. Concerned that the teachers were trying to stifle their democratic freedoms, the boys decided to try to recruit more to their cause. Toby isn't keen because he's not as keen on the cause as the others assume he is. If he'd had better debating skills he'd have never worn one in the first place, and given the choice, he'd rather wear long trousers than shorts anyway. But his lack of debating skills get the better of him and he ends up going with the majority and he even ends up helping to produce the campaign leaflets. He helps to write a rousing article for the school magazine, using some of his mother's arguments and examples of why it's important to stand up and be counted... the following week, numbers are up and by Wednesday, around fifty boys turn up wearing skirts. “Yeah I guess.” he said. Truth be told, walking to school wearing a short skirt in the driving rain was probably better than wearing trousers. His legs dried out far quicker than a pair of trousers would have. The rain had cleared by lunchtime but the temperatures had dropped considerably after the recent heatwave. He casually mentioned that it was a little bit chilly and wondered how the girls cope when it's really cold. “They wear tights.” his mother replied. “Not all of them.” he countered, listing a handful of girls who somehow manage to brave the entire winter in either knee or ankle socks. “True.” his mother said. She claimed that girls are just tougher than boys in that respect. They're used to bearing their legs and have simply become more acclimatised. She tells him that she'd buy him some tights if he wanted. She passed him a paper bag and he delved inside. “Mum these are girls ones!” Toby moaned. The next day, Toby was the brunt of numerous taunts and teases thanks to his pelerine knee socks. He tried to hide their girlie style by scrunching them down to the ankles, but the rule for the girls is if knee socks are worn, they must be pulled up and his teachers insisted that his were too. Plenty of girls praised his socks though. Coupled with the fact that he's got rid of his leg hair and wears his skirt nice and short like most girls do, they've come to believe that he's the only boy who's actually trying to look nice. Little do they know that if it was up to him, he'd have never got involved in the stupid protest in the first place. After two weeks of promoting their campaign, it seems that around fifty percent of the boys have joined in the protest and a regularly attending school wearing skirts; either sourced from their sisters or bought specially for the ongoing protest. Their parents seem to be backing them, the teachers seem to think they're going too far and the headmistress, deputy and members of the PTA are reportedly 'up in arms' regarding the continued protest. After three weeks, there's a significant breakthrough... the school has decided to 'review' their uniform policy... but it's not enough. They don't want a review, they want change and they want it now! Some thirty percent of the boys continue wearing skirts throughout the following weeks, and as the end of term nears, they feel victorious when it's announced in morning assembly that after a lengthy protest and plenty of consideration from both staff and PTA members... from the beginning of next term, boys (and girls) will be permitted to wear short trousers if they wish. A joyous cheer erupts in the hall. It takes a few moments for the headmistress to quieten them down. “The revised uniform regulations have been posted on the notice board and the school website has been updated.” she informed the assembly. “Hopefully this ridiculous protest will cease here and now.” she sternly said. The assembly is dismissed and they head to their respective classes with a strong sense of triumph. Their sense of triumph however, is short lived. At morning break a handful of pupils bother to read the new uniform regulations on the notice board. The rumour spreads quickly and during lunchtime, seemingly half the school are trying to read the new regulations. What the headmistress failed to tell the assembly was that from the beginning of next term, long trousers will no longer be permitted! “How was school today?” his mother asked when he returned home. “Not really.” he moaned before informing her that they won't be allowed to wear long pants any more. “Not even in winter!” he whined. “And what do they think of the new rule?” his mother asked. “Because they can't wear long trousers either?” she asked. Her son nodded, slumped into his fist and sighed through his nostrils. “It's gonna be freezing in winter.” he grumbled. “It's not gonna be that warm in September.” he added. “So... what are they like?” his mother asked. “Oh, I'll have a look later.” she said. “Aren't you bothered by it?” he asked. “Don't you think it's unfair?” he quizzed. “We wanted the right to wear shorts, not to have our right to wear long pants taken away!” he claimed. “What... and wear this instead?” he retorted, sneering at his skirt. “Well you've been wearing it quite happily so far.” his mother reminded him. Toby kicked his feet out in front of him and straightened his socks, making sure that the pelerine pattern was straight and the tops were level. He completed his homework than changed out of his uniform and hung his skirt up once and for all. Later that evening his mother tells him that she'd had a look at the school website and told him that the new school shorts aren't anything like she'd imagined. “I thought they'd be cargo style shorts, but they're really quite short.” she said. “No way!” he gasped. “That's shorter than my skirt!” he added. “Even with knee socks they'd be freezing in the middle of February.” he presumed. “Not if you wear tights.” his mother informed him. “You can. It says so.” she replied. “I'm not wearing tights.” he stated. “You won't be saying that in November.” she knowingly claimed. Toby found himself in denial. Maybe his mother was winding him up. Maybe she liked the idea of sending him to school in short girlie shorts when a longer, more boyish style is permitted. His mum was always complimenting his legs and saying how nice it is to see them for once. It was her who pestered him into wearing a skirt in the first place, and it was she who suggested he remove his leg hair. She even bought him some girl's knee socks because they looked better with his skirt than boy's socks did and Toby just let himself get pestered into wearing them. Maybe it's just his mother's ploy to buy him some short girlie shorts? He checked the school website himself and his heart quickly sank. It states quite clearly that the black tailored shorts must have an inside leg between one and three inches, and that either white ankle or knee socks, or plain black tights must be worn. “Mum... what's denier mean?” he asked as he sulked at the laptop. “It's the thickness of nylon.” she replied as she approached. “Checking the new uniform rules?” she asked, noticing the school's webpage on the screen. “White socks are nice.” she replied. “Only because it was a protest.” he whined. “I'm not gonna wear this again if I can help it!” he sneered, grabbing at its pleats and letting them drop. “Well whatever we do, it's got to comply with school rules... that was the beauty of our shorts protest... we complied and there was nothing they could do.” Toby replied. “I think I'd rather wear a skirt.” one of the boys reluctantly suggested. “Those new shorts look too short for comfort.” he claimed. The other's agreed that the shorts look far too short, but aren't quite so keen on continuing to wear their skirts. “I guess we just have to swallow it.” one of the ringleaders suggested. “We still won, we just got more than we bargained for.” he claimed. The others muttered their vague agreements. They'd all got swept along with exercising their right to protest. They couldn't resist the sense of rebellion and camaraderie that came with it. They'd geared themselves up, got themselves organised and weren't going to back down until their goal had been achieved. They had access to the photocopiers, the print room, they made leaflets and posters, wrote articles for the school magazine, campaigned throughout their break times to get more kids on board... all in the name of the cause. Throughout the last week of term, all those who'd been most active in the protest were frequently berated by those who weren't involved and even some who were. They were criticised for not being clear enough in their campaign. They should have proposed a particular style and stated that shorts should be optional. They should have argued for a referendum, giving the pupils the chance to vote between the existing rules and the new ones... but no... they demanded the right to wear short pants to school and that's exactly what they've got. Nice one! Sure wish my school had been like that. Of course, I would have pretended to not like wearing skirts, but secretly been thrilled. Here in the states, very few public schools have school uniforms. It's mostly the private and religious schools that have them.